There are 100s of websites that claim to offer cheaper rates for hotel bookings. Some of them do, but come with lots of riders. Since past 2-3 years, I have been booking one website extensively for my international and domestic hotel bookings- booking.com. I was also using Stayzilla a bit but they have shut shop now. In this post I am explaining why I like Booking.com much more than any other hotel booking sites. Read on, if it makes sense do booking.com for your future hotel bookings. The main difference between booking.com and most other sites is the payment terms. Almost every other website wants you to pay upfront. Pay first and then get your booking confirmation. Booking.com lets you have a confirmation without making an actual payment, in case of majority of hotels. You can pay at the hotel or your card will be charged the previous night. This is lot convenient and flexible option for me, than paying upfront and then seeking refund in case of change of plans. I can block a room at cheap rate, refine my plans as the travel date is closer, make some adjustments/cancellations without having to shell out more money. At times I made an attempt to book direct with hotels, but that was not as convenient as booking via booking.com. Either their rates were higher, or they needed advance payment or the reservation widget on the hotel's website was managed by 3rd party vendors who were more interested in taking my payment, than giving me all the information needed to make an informed decision. Most hotels on booking.com allow free cancellation, up to few days prior to check-in date. This offers huge levels of flexibility. If I want to change my plans or if my trip gets cancelled, I can do that without fear of losing money. Note: Some hotels keep a higher room rent with free cancellation and give another cheaper option for same room, but a non-refundable mode. In such cases you need to decide if the extra amount is worth the flexibility. Note 2: Cancellation policy varies from hotel to hotel and season to season. Booking.com has much better collection of properties- from dirt cheap hostels to luxury hotels than most of its rivals. Many hotel booking websites ignore low cost, low margin hostels. With booking.com, it is possible to get a place to stay that fits your budget or one that fits your location preferences or other priorities. Many competitors have accommodation as one of the many services they offer- like flight booking, holiday packages etc. With booking.com, entire focus is on accommodation bookings, which is good. They have over a million + properties worldwide. I have complete control to manage my booking via app or website- to cancel, to message the property, to change dates etc. No need to call customer care, no need to email. Additional facilities like directions, location guides and reminders make your trip lot more convenient. Reason 7: Excellent customer service. I was not very happy about one of the bookings made via Booking.com- The Galle one- while property refused to entertain my complaint, Booking.com voluntarily offered a small compensation. They even called me to take my feedback and hear my case. That was very impressive customer care. Full details in this post. Many websites resort to tricky marketing to make you believe they are giving rooms for less. For example, GoIbibo offers huge discount, but in a very complicated way- you need to pay a large amount upfront, an amount more than normal room rate, wait for 30-50 days and cashback amount will be credited to your wallet which can only be used for future booking. To me this is too much circus. MakeMyTrip often launches “up to 50% discount” but to get this 50% discount there will be several conditions like you need to book same hotel for 7 nights, max discount Rs X only etc. I hate it when brands make tall claims of huge savings but supplement it with complicated process and hidden rules. Booking.com anyway offers cheap rates all the time in a fairly transparent way. No complicated cashback process. Even if it is a few rupees more, I go with them for the simplicity of the process. Reason 9: Clear indication of what is included and what is not. Any tax not included in the specified amount is called out separately. All facilities offered in the room are listed clearly. All the key information we need- photos of the property, how far it is from airport etc, what’s free, what’s not etc are almost always listed very clearly, so that we can make an informed decision. Repeat customers- called Genius accounts are entitled for some additional discounts/extra facilities (like late check out). Not available with all properties though. Worldwide, I have observed that many hostels and properties take pride in being part of Booking.com network. They display their Booking.com rating with pride, along with tripadvisor rating. Always the amount mentioned in the confirmation is charged. This is very confidence inspiring for me, as a traveller. I can trust the rating on booking.com, I can trust the rates for being reasonable and I am assured of good support/customer care if needed. 1. Beware of hotels that want to charge some amount upfront. Once a hotel in Copenhagen charged 38k+ on my credit card upon booking. When I cancelled the booking later, they refunded the amount, but since ICICI bank charges currency conversion fee for both transactions at about 3.5%, I lost about Rs 2800 in total for no fault of mine. 2. No filter to identify hotels having 24 hour checkout facility. 3. Some hotels do not add photos of their cheapest category rooms- so if you're booking cheapest room looking at photo of most expensive/medium range rooms you might be surprised when you arrive and check-in. A bit of extra caution helps. I haven't tried AirBnB yet. Most of my trips are often hectic and I only need a place to sleep. Haven't had the luxury of spending leisure time with local hosts. Which site do you use for your hotel booking? Does it offer any extra advantages? Do share your opinion. Disclaimer: This is NOT a sponsored post. 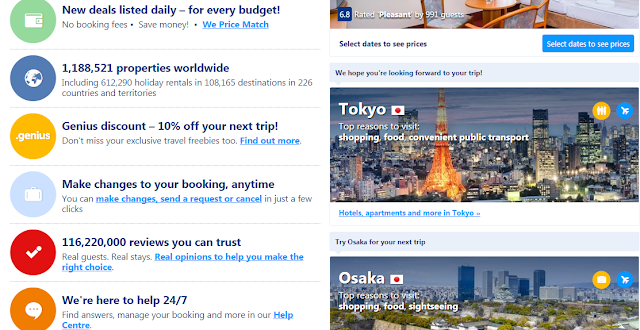 I have been using booking.com personally since past few years and am impressed by the options and services offered, so much so that in most cases I don’t even check competition websites. If there're better options you've been using I am keen to know. My hotel booking in Bali, Manila, Macau, Hong Kong, Copenhagen, Coimbatore and many more were via booking.com. All points are based on my personal experience, but please use your discretion. Wonderful review. I love booking.com, been doing all my hotel bookings off late through them. I have been using Goibibo for all my bookings for the last couple of years. It gives me unbelievably low prices for any hotel I want to book. Not sure if you've tried it.Would like to know. @Vipul- I checked GoIbibo a few times, but their process was complicated- while they promised like 80% off, it is like I had to pay 120% upfront, after 2-3 months most of it will be credited to wallet, which I need to use for a new booking within X days- I find this circus too complicated, so didn't book. Nice review. Even we are loyal Bookings.com customer. Sometimes we just monitor the availability of the hotel from bookings.com and when we are sure booking will be available at the time of walk-in then we don't book. It is easier to negotiate rates over the booking desk particularly on international travel. Yes. Even I have booked many hotels on this booking.com. Comparatively good. Thanks for sharing such an informative post. Very well reviewed. I think it is a trade off between having some certainty about room confirmation vs trying save few more bucks. I prefer some confirmation as I need to plan rest of my day depending on hotel location.